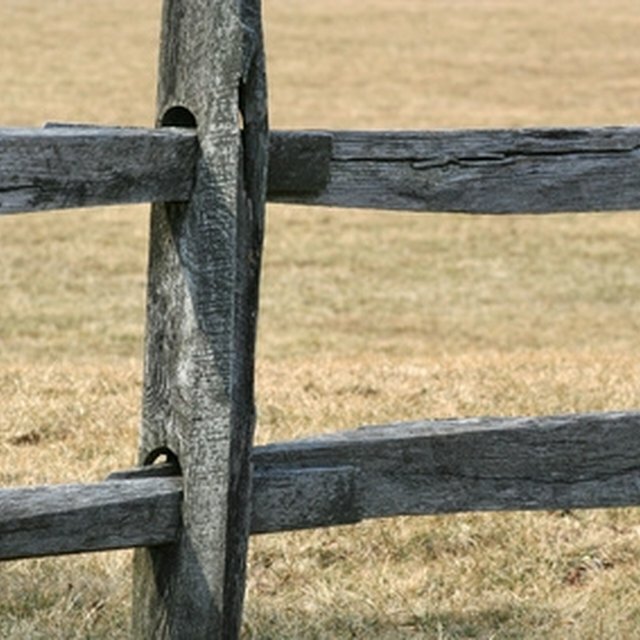 The garden variety of split-rail fencing is made of rough-split cedar. The trick to making angles lies in the holes--or mortises--you cut into the fence posts to receive the ends of the rails. The posts are available with or without the mortises already cut. Precut corner posts are mortised on adjacent faces for making 90-degree angles. If the angle you want is close to 90 degrees, there's probably enough play in a precut corner post to allow for adjustment, and you can chisel out the mortises or trim the rail ends a little, if necessary. To create other angles, start with uncut posts and create your own mortises. Cut the proper mortises into fence posts to create unusual angles. Lay out the fence line using stakes and mason's string. Mark the location of each post onto the string, using tape, then dig the post holes. Set an uncut post into its hole at each corner that will form an angle (other than 90 degrees). Orient the post so the broadest, flattest sides (facets) will receive the rails. Use a level to hold the post plumb--it's a good idea to have a helper for this step--and draw a straight line across the top of the post that follows the angle of the fence line. This line represents the angle at which the rails will meet the post. Secure the post to a work surface. Mark the location of each mortise, following your fence plan. If you're using precut posts elsewhere in the fence, match the positioning of the precut mortises. The mortises should be centered on the post facets. Using a drill with a 1-inch or larger bit, drill at the top and bottom of each mortise while holding the bit parallel to your reference line on the top end of the post. With a smaller bit, you may need to drill two holes at each end of the mortise. Cut out the wood between the drilled holes, using a reciprocating saw. Clean up the cuts and corners as needed with a sharp chisel, then test-fit the rails in the mortises. Split cedar rails come with or without square-cut ends (called tenons). You can use either, but make sure to size the mortises to match the rail ends. It's acceptable to have a little play in the joint. Build the fence using the standard split-rail techniques; the custom-mortised corner posts install just as the precut posts do.